This beautiful sunset image was taken at one of the most memorable weddings I’ve ever had the pleasure of photographing. It took place on the bride and groom’s 14 acre estate on Long Island just a short convenient drive out from NYC. The property featured sprawling lawns, impeccable landscape design, long meandering drives onto the property (which is not visible from the road) and an amazing barn that was converted into one of the most elegant celebration spaces that I have ever seen in my years as a Long Island and NYC wedding photographer. 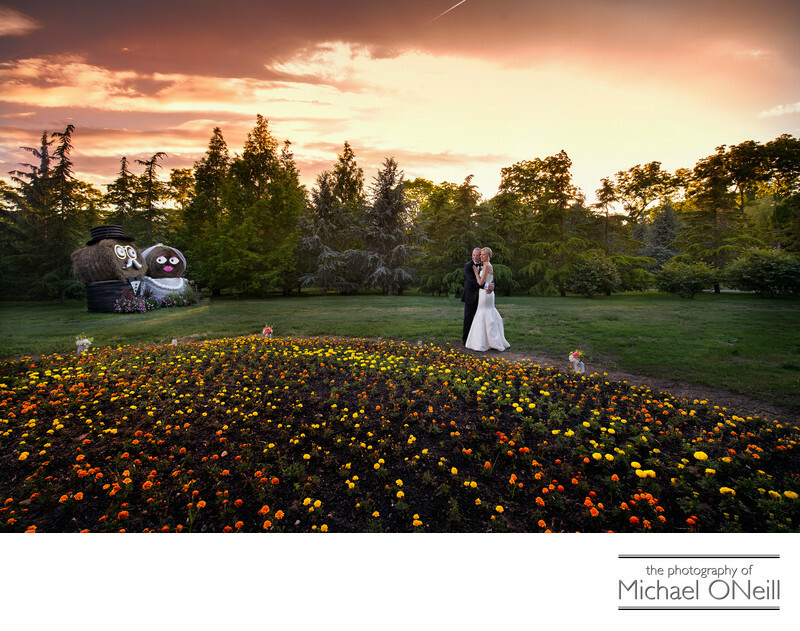 This image was taken at sunset on their wedding day alongside a freshly planted garden of 5,000 individual plants. In the background can be seen a pair of caricatures of the couple fashioned from two full sized agricultural bales of hay. In my career as a New York wedding photographer I have had the opportunity to photograph many barn weddings from private estate properties (Like this one) to the rustic structures located on the grounds of some of Long Island’s east end, north fork vineyards and wineries. The rustic and casual atmosphere of a barn wedding is something you need to be a part of to understand. To many couples who have a love of nature and all things outdoors a barn wedding is the perfect expression of their personalities. If you are planning a barn wedding on Long Island, or anywhere else for that matter, give me a call. I would love to discuss your vision of the perfect wedding day with you and offer some ideas on how to make it the most amazing event ever.